Alumnus Dr. David Robinson (Worcester 1997) sent us this brief update, having witnessed the magnitude 6.9 Lombok, Indonesia earthquake where more than 90 deaths and many more injuries have been reported. Find out more about the earthquakes in Lombok via the USGS interactive website. 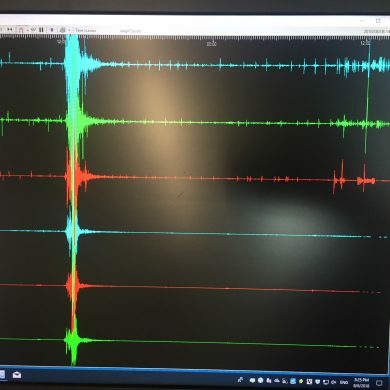 Image: the department’s seismology monitor display, showing the recent earthquake tremors.